This is the blog of our trailer sailor, gaff-rigged small yacht, which we bought in 2012. 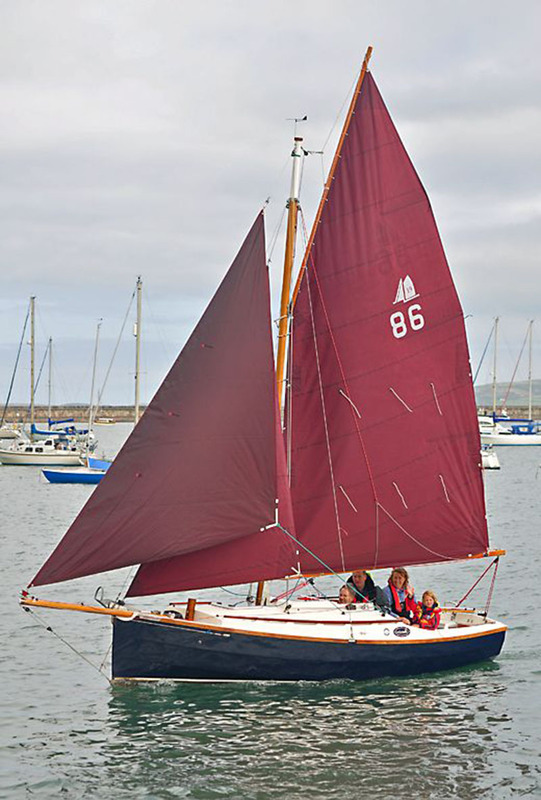 Aurora is a Cape Cutter 19, sail number 86, built by Honnor Marine in Rochdale. We are a family of 4 and chose a trailer sailor because we live in the midlands. This allows us to sail in different waters around the country. The CC19 is small enough to be comfortably towed by our campervan, launch and recover quickly and explore shallow waters that larger boats cannot safely enter. Aurora has acquired a character of her own and has been the focus of some wonderful adventures. We are looking forward to more adventures in the coming seasons, anchoring up for swimming or lunch. The Cape Cutter can also take the ground, and we have taken advantage of that capability too (not always on purpose!). After looking at other boats of a similar size, we decided that despite being very good value for money, they are sturdily built (important to have confidence in the boat) and look lovely too. Look at the pictures and judge for yourself! I am writing this blog partly as a record for myself to remember our adventures and any work we do on the boat and partly so any other interested parties can see what we have got up to…. Thanks for your comments. I am only just getting into a routine with rigging, but it already seems fairly manageable. Going to Anglesey in August, so more posts to follow…. Beautiful little boat, I own an Edey&Duff Stonehorse 23 that is much in the same pocket cruiser bracket, though less trailer able. I’ll be posting about upgrades to mine soon and look forward to following your trip logs and modifications. Thank you for your blog. I am slowly falling in love with the cc 19 and am in a similar situation: 2 kids and a campervan living in the middle of the UK. I would be very interested to hear what previous experience you and your family had before taking the leap of buying Aurora. Our previous experience was having a racing dinghy. My wife did not really like this, as she didn’t like capsizing. We wanted a large day boat which would not capsize. Initially, I did not think a 20-foot boat would be big enough to sleep us all, but after looking at all the drascombes, swallow boats and the like at the boat show, realised how flexible the CC19 is. Dont get me wrong, 4-up staying aboard the CC19 takes some planning, but we’ve had a lot of fun with Aurora. As the kids have grown, we have been able to do dad and daughter trips, as well as all four (I’ve done some solo trips too). Every boat is a compromise and my advice is to think what you want to do with a boat- we do short trips and spend some nights aboard mostly, with many trips spiced up by some of the “team” sleeping ashore with grandparents, in the camper van, etc. If you are in the camping/camper van mentality, you’ll cope with snuggling in the CC. Thanks for the reply. I am quite a new sailer so am thinking a couple more years of regular dinghy sailing plus, possibly some bigger boat training may be wise before I go for it. Based on the campervan experience and the kind of holidays we do I am sure that the cc19 is the perfect boat for us. Keep sailing; the cc is very much like a big dinghy to sail. I would recommend a day skipper course. What about putting the cc on a mooring on a reservoir (sheltered water) whilst you build experience? Thanks again. I was planning on doing the Day Skipper course next year, but I like your idea of keeping a cc inland for a while. It also means I can keep an eye out for one and give in to temptation if the opportunity comes up. I’m writing a feature on the CC19 for PBO. Could I possibly reproduce one or more of your photos please? Thanks for that – I’ll see what they want and get back to you.